The 2018 Ford Fiesta hatch is the continuation of the sixth generation subcompact hatchback in the US, with the 7th generation seen in the rest of the world unlikely to make it Stateside. That said, a punchy 1.6-liter inline-4 offering 120 horsepower and 112 lb-ft of torque pairs with either a 5-speed manual or 6-speed dual-clutch automatic gearbox and the most engaging front-wheel drive chassis in the segment for an exciting package to boot. Priced from just $14,505, three trim levels are offered with the Titanium Hatch packing the most luxury by offering Ford’s SYNC 3 infotainment system, a rear-view camera, cruise control, and auto-dimming rearview mirrors. With rivals like the Chevrolet Sonic and Toyota Yaris, the Fiesta hatch is still a compelling proposition. Though the rest of the world has a new Ford Fiesta, for 2018 the USA soldiers on with the older, yet still robust model that’s been with us from 2011. 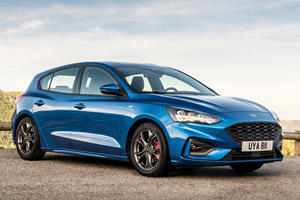 The subcompact hatchback remains the most driver focused in class, with an engaging front-wheel drive chassis, however since the EcoBoost motor was dropped from the line-up in 2017, enthusiasts may still find the performance somewhat lackluster. Two gearboxes and three trim lines are offered for the MY 2018, though major changes are expected for the MY 2019 Fiesta if you can hold on until then. The MY 2018 Ford Fiesta is yet to benefit from the design upgrades endowed upon the rest of the Ford vehicle line-up. Drawn back headlights rest on either side of Ford’s low-mounted hexagonal grille, with foglights featuring on all models above the base Fiesta S. The Fiesta S features 15-inch steel alloy wheels, while higher trims get larger, more stylish 16-inch alloys that fill the arches better. Blacked out B-pillars on all models open up the side profile, giving the compact Fiesta a larger appearance than the compact dimensions suggest, while at the rear, a large rear windscreen bodes well for rear visibility. Sadly, since 2017, just one engine is offered across the Fiesta hatchback range. After dropping the turbo-triple, a naturally aspirated 1.6-liter 4-cylinder gasoline motor is the only remaining choice, boasting outputs of 120 horsepower and 112 lb-ft of torque. Drive goes to the front pair of wheels though either a 5-speed manual or 6-speed dual-clutch automatic gearbox (the only option on Titanium models). The dual-clutch is sluggish, and like most dual-clutch setups, traffic or parking lot scenarios are highly infuriating. The automatic does have the benefit of improved fuel economy on the highway, with 37 mpg to the manual’s 35, though both average 27 mpg in the city. The Ford Fiesta seats 5, though two adults in the rear doesn’t leave much room for anyone other than a small child in the middle. There’s decent interior leg room, more than a Yaris, albeit less than the highly versatile Honda Fit. The interior design has aged since introduction in 2011, though Ford is still keen to offer high quality materials like leather on the main touchpoints. If you’re looking for leather upholstery, however, you have to buy the pricier Titanium model. SYNC 3 is the highlight of the Ford Fiesta’s interior, only available optionally on the mid-spec SE and standard on the Titanium, but featuring 2x USB ports and high quality voice recognition. With the rear row of seats in place – it splits and folds in a 60/40 split – the Ford Fiesta offers a paltry 14.9 cubic feet. With the rear seat deployed that figure grows to 25.4 cu. ft. – both figures lag behind most rivals, with the best in the segment being the Honda Fit with its cavernous 52.7 cu. ft. maximum. 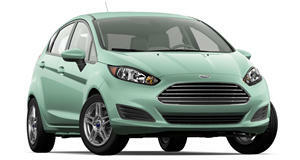 Still, against the Toyota Yaris, the Ford’s cargo volume is comparable but still smaller. Though down on main luggage volume, the Fiesta does offer numerous in-cabin storage options, with large door pockets, four cup holders, plenty of smaller bins, and good storage volume available in the center console. The oldest by some margin in this segment, the Ford Fiesta is still the best driver’s car out of the lot. The manual gearbox offers clean, precise shifts, while the chassis is by far the most playful – besting even the Honda Fit Sport. The suspension errs on the firmer side of things, but there’s a certain joy it affords when you lob it down the street and the tautly sprung setup lets you know exactly what’s happening at all four corners. The steering is adequately weighted and dishes out feedback by the heap, but is never overwhelmingly sensitive. It’s still a commuter car, but one that reminds you driving should be enjoyable. On the whole, the Fiesta has proven to be a fairly reliable car since launching in 2011. However, problems have been seen repeatedly on the dual clutch PowerShift automatic gearbox. In addition to being laggy and jerky, particularly at low speeds, there have also been numerous reports of the gearboxes sustaining damaged clutches as early in their life as 15,000 miles. The PowerShift issue has resulted in several class action lawsuits. Other problems, for which recalls have been performed, include door latch failure that sees doors fly open, issues with the passenger side curtain airbag, a leaking fuel tank, and a leaking cylinder head. Get a manual, save yourself the trouble of the PowerShift. The 2018 Ford Fiesta hatch starts from $14,505 for the base S trim, with the SE setting you back $15,735, and the range-topping Titanium coming in at $19,495. That makes it cheaper in base trim than its closest priced competitor, the Hyundai Accent hatch at $14,995, and cheaper than just about all rivals, though the top-spec Titanium is some $1,000 more than comparable top trims from rival brands. The mid-spec SE offers the best bang for your buck with cruise control, a rear 12-volt socket, manual air conditioning, and MyKey all standard. Throw in the SE Appearance Package as an option for just $995 and you’ll get a bundle including SYNC 3 with 6.5-inch touchscreen, two USB ports, sport seat cloth, and unique 16-inch alloys. The Ford Fiesta hatch is a cracking car for those who enjoy the thrill of driving. But it is aging now, and with that it brings a dated interior and looks that have become staid. Newer rivals also offer more cargo volume, both behind the rear seats and with the rear bench flattened, so if practicality and utility are what you’re after, you’d be better off looking at the Honda Fit. If fun is what you’re after, get the Fiesta, but whatever you do, get a manual and avoid the pesky PowerShift. It even has ground-up parts from the original car that was destroyed last year in the paint. 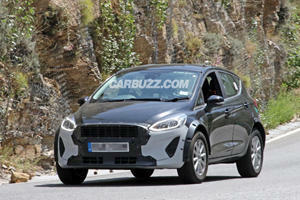 This could be the closest we get to the new Fiesta.